Fulton, NY – When Catholic Charities of Oswego County’s CYO program was forced to relocate to its current location inside the St. Michael’s Church building at the corner of West Third and Beech streets in Fulton it was unable to bring with them one of the most popular aspects of the CYO program. Thanks to the efforts of Tracy Doyle of Doyle’s Bike Shop and Gary Stanard of Gosh Lighting and Supply, basketball is back at Catholic Charities’ CYO program in Fulton. From left are: Norman Richardson, Chris Holbrook, Tracy Doyle, CYO coordinator Stacie Roberts, and Joshua Broadwell. While the CYO program’s core services and activities continued there was no gym and no basketball. When Tracy Doyle of Doyle’s Bike Shop heard of the plight of the CYO program he knew he had to do something. “As a boy I remember going to the CYO program at Catholic Charities and how much I enjoyed playing basketball. I know that while the kids love going to CYO after school to be with their friends and they enjoy playing video games, billiards and other games, one of the biggest draws was being able to play basketball,” said Doyle. A strong supporter of area youth and the CYO program, Doyle has collected countless numbers of bikes over the years that he has restored and given away to youth in the Fulton area. Additionally he and the Fulton Area Snow Travelers group have made regular donations to the CYO program including game stations and video games, sports equipment and more. “Each year the Fulton Area Snow Travelers host a vintage snowmobile show, The Great Eastern Whiteout. Money raised at the event is used to benefit the youth of our community,” explained Doyle. 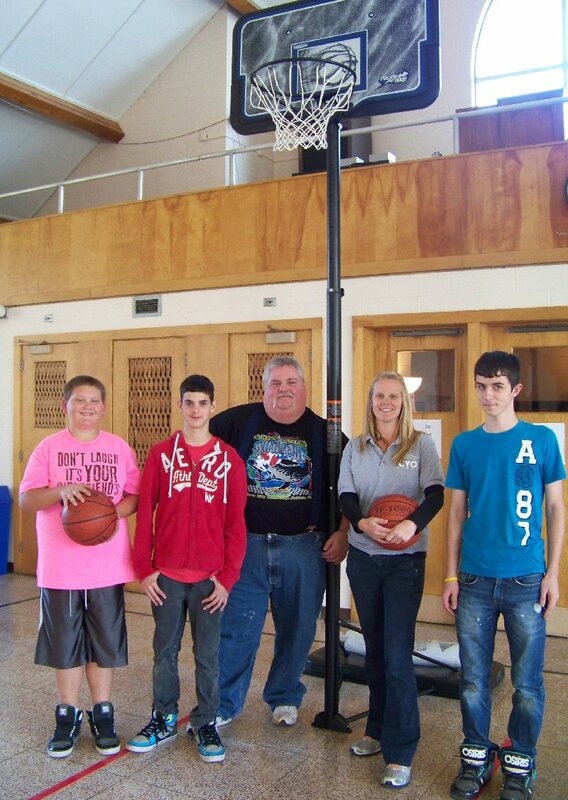 After speaking with Mary-Margaret Pezzella-Pekow executive director of Catholic Charities, and CYO coordinator Stacie Roberts and receiving the go ahead from Gary Stanard, owner of the St. Michael’s Church building, Doyle purchased and donated two portable basketball hoops to the CYO. With the space that the building provided there was plenty of room to place the hoops and bring basketball back to the CYO. CYO is open to youth in grades 2 – 12, Monday through Friday from 3 to 7 p.m. and 10 a.m. to 2 p.m. on Saturdays. Activities include; basketball, foosball, dodge ball, ping-pong, billiards, computer games, and more. There are also a number of computers available for youth including several that have computer access to assist them in doing their homework. The CYO program will also be available from 10 a.m. to 2 p.m. on the following holidays: Columbus Day, Day after Thanksgiving, Christmas Eve, Martin Luther King Jr. Day, President’s Day, Good Friday and Memorial Day. Additionally, CYO will be open from 3 to 7 p.m., weather permitting, on snow days and during school breaks. All activities are free of charge and are supervised by trained staff. The staff encourages youth involvement in both structured and non-structured activities, and assists all participants as needed to insure that they receive the full benefits of the program as well as help in their physical and mental development. Primary funding sources for Catholic Charities of Oswego County programs are the United Way of Greater Oswego County, the Diocesan Hope Appeal, the County of Oswego, NYS Office of Children and Family Services through Oswego City/County Youth Bureau, and private donations by individuals and local companies and organizations.